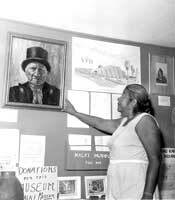 Jane Penn, a Wanikik (or Pass area) Cahuilla, was raised to learn the importance of her Native heritage and she lived and cherished it throughout her life. She was born on May 6, 1910. Her father, William Pablo, was one of the last and greatest medicine men. Her grandmother, who lived to be 120 years old, and an aunt, who lived to be 96, both told her stories as a child of their Wanikik Cahuilla heritage. Many of her nephews sang birdsongs and someof her uncles were even Ceremonial House singers, knowing the songs of only a special few. As a young girl in the early 1920s, Jane attended St. Boniface School in Banning. In those days, the land surrounding the town of Banning and the Malki Reservation (now called the Morongo Reservation) was thick with almond and apricot groves. As a teenager, Jane wanted to see more of the world and went to live with a sister in Los Angeles. Living in the larger city of Los Angeles, Jane’s experience and knowledge expanded to include the world outside of the reservation. This experience paved the road for her return to the Morongo Reservation at age 49 with an even stronger conviction to create a place where her culture could be preserved and taught for generations to come. In Los Angeles, she worked in a factory during WWII that manufactured plane parts for the war, and she also met her husband Elmer there. He returned with her to live on the Morongo Reservation, where she had some family land left to her. In 1952 Jane began working at the Banning shirt factory, making 60 cents an hour. There she joined forces with another young Cahuilla woman from the Los Coyotes reservation, living on the Morongo Reservation with her husband Mariano Saubel, who was Jane’s cousin. That woman was named Katherine Siva Saubel. Over time the two women realized they had similar visions and strengths and first exercised their personalities by forming a labor union within the shirt factory – the first union in Banning. At first only four women joined the union, but when the factory decided to raise their wages by $1.00 per hour (to a total of $1.60 per hour), it became a success and many joined. 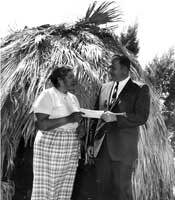 Lowell Bean, a young ethnographer, discovered Jane and the Morongo Reservation in his quest to find educational materials for his anthropology degree. Jane offered to teach Lowell about her culture in exchange for his help, and he agreed. The first thing Jane had Lowell assist with was not the recording of cultural heritage he may have been hoping for. Instead, it was to gather and clean eggs in the mornings from her chicken ranch in exchange for cultural discussion in the afternoon. One of Lowell’s fond memories of Jane was that she was an excellent teacher, kind, but “she was not afraid to bawl you out if you needed it.” Jane introduced Katherine to Lowell Bean, and a great collaboration began which produced many books, events, and other opportunities. When Jane’s elderly aunt Margaret Pablo and cousin Victoria Weirick passed away, they both left her their collection of artifacts, which she received in 1958. 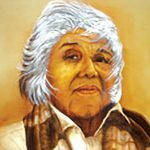 She wanted to preserve the traditions, culture, and language that were slowly slipping away as elders died and many left the reservations to seek jobs, so in 1964 she brought together a group of Native and non-Native friends she had known for years and set out to found the first non-profit Indian museum on a California reservation. Among these friends were Lowell Bean and Katherine Siva Saubel. Jane asked Katherine to be the Museum Board President because of her knowledge of the Cahuilla culture and language, and Jane herself assumed the role of director and treasurer. Their vision for the museum expanded to include all of Southern California’s Native American tribes, not just their own Cahuilla people. 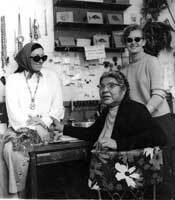 Both Katherine’s husband Mariano and Jane’s husband Elmer helped to form the museum with their hearts, hands, and minds. Mariano would begin building fences and ramadas by himself and soon the community showed up one by one and began to help. Katherine had the better car so she began driving Jane, spending many hours together in the car discussing their ideas. Jane and Katherine’s partnership enabled the dream of a museum and cultural center to become a reality. Jane Penn was co-founder and director of the Malki Museum on the Morongo Reservation, and her efforts toward protection of the Indian heritage won her honors from the Indian and white communities. She was a winner of the SCOPE (self help, citizenship, opportunity, principle, education) award of the Pacific Region of the Soroptimist Federation of the Americas. She was one of eight distinguished Native people named as an Honored Indian Historian by the American Indian Historical Society, and in 1977 was appointed by Gov. Jerry Brown as the first Native American woman from Southern California to sit on the Native American Heritage Commission. She was a member of the State Inner-Tribal Council, a member of the Morongo Tribal council, and an honorary member of the Soroptimist International of Banning. Jane was one of two American Indians to attend the International Conference on Discrimination against Indigenous Populations in Geneva, Switzerland, in 1977, one of the many forums at which she spoke out against the deprivation of the Indians of their lands and heritage. Jane died at age 69, on Saturday, March 22, 1980 at Loma Linda University Medical Center, following a lengthy illness. She had no children, but dedicated the last 20 years of her life to preserving her Native American heritage and culture. Katherine later took Jane’s place on the Native American Heritage Commission, and continued to work preserving their culture in her capacity as President until her passing. It is due to the extraordinary vision of these two strong women who fought to keep their heritage alive that we have the privilege of enjoying the Malki Museum today.